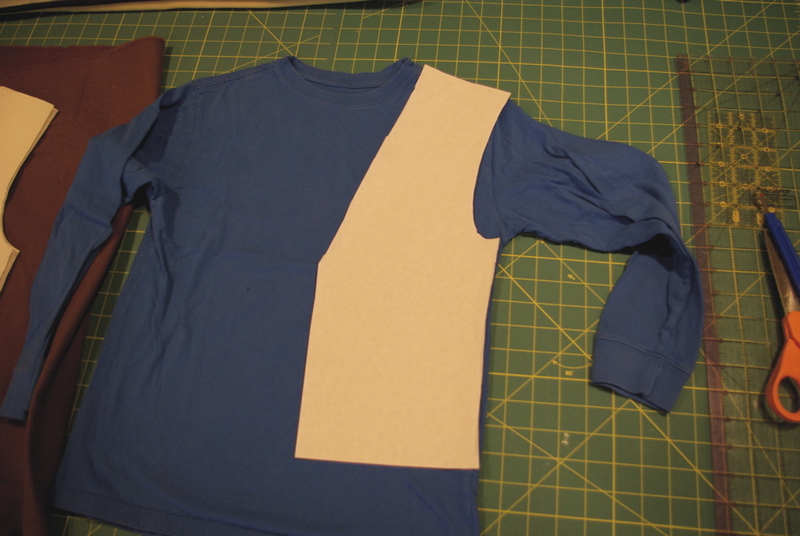 I didn’t have an adequate vest pattern handy, so I had to make one up for myself; this is easily done. Find a t-shirt from the person who will be wearing the costume to use as a size template. 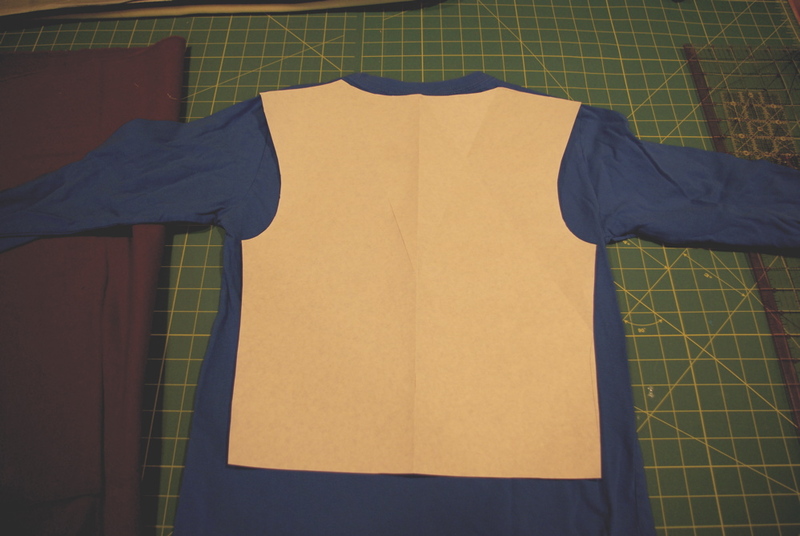 Lay a blank piece of butcher paper under the shirt and traced the general shape of the front of a vest that will fit your person. Cut out the front pattern piece, draw and cut necessary adjustments (if needed). 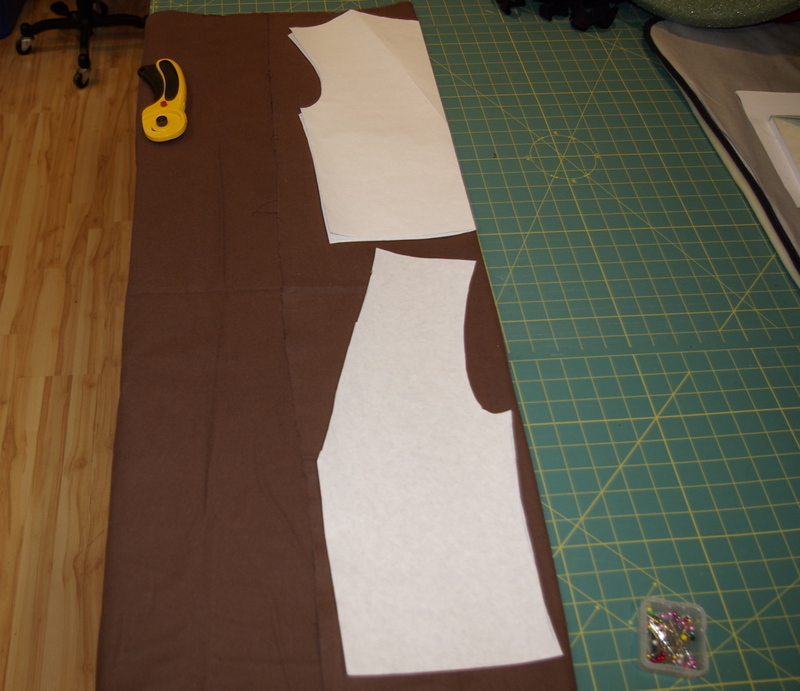 Do the same for the back of the vest- lay down paper, draw the shape you want, and then cut out the pattern piece. Fold the back pattern piece in half, fold the fabric in half too. Lay the center back of the pattern piece on the folded edge of the fabric. Lay the front pattern piece so it will be cut twice, but not on the fold. You should end up with a back and two front vest pieces. Placing the right sides together by laying the two vest front pieces on top of the pack and matching up the side and shoulder seams. Sew the side seams (under the arm on either side) together. 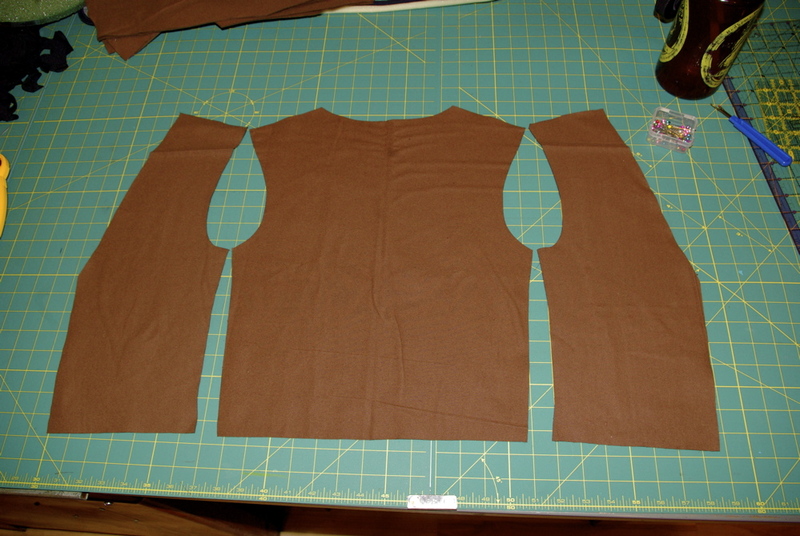 Then sew both the shoulder seams together. Turn the vest right side out. You can finish the edges by turning them under and sewing them flat if you would like a more finished look. This is what the vest should look like when it’s been sewn together and turned right side out. If you can, it is a good idea at this point to try the vest on and check the sizing and fit, make any necessary adjustments. 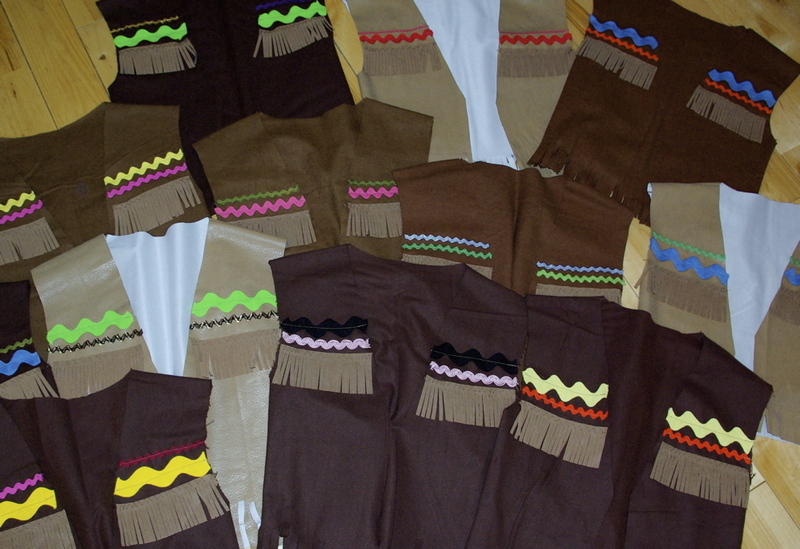 Fringe trim can be found at any craft or fabric store. 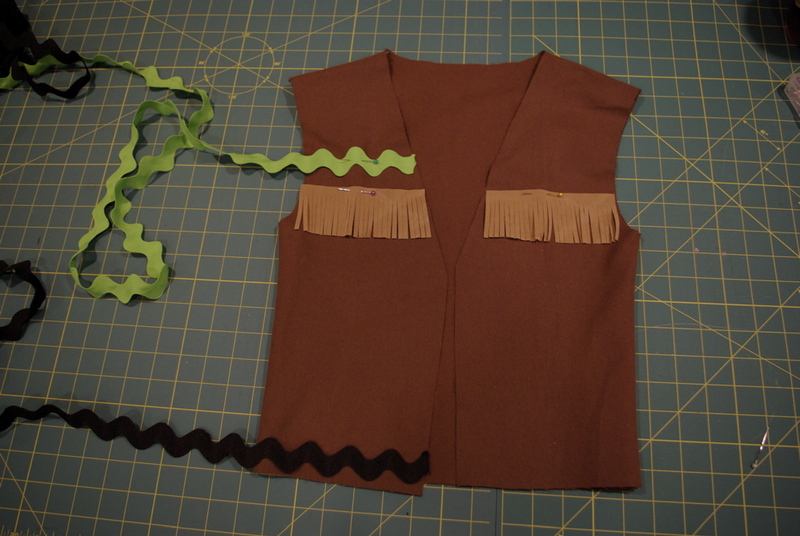 I cut two short strips of the fringe and sewed them across the chest then used rick rack about it- an easy way to add color and a zig zaggy design to the vest. I decided not to use rick rack on the bottom edge but cut fringe instead. Use various colors and sizes of rick rack for a nice affect. 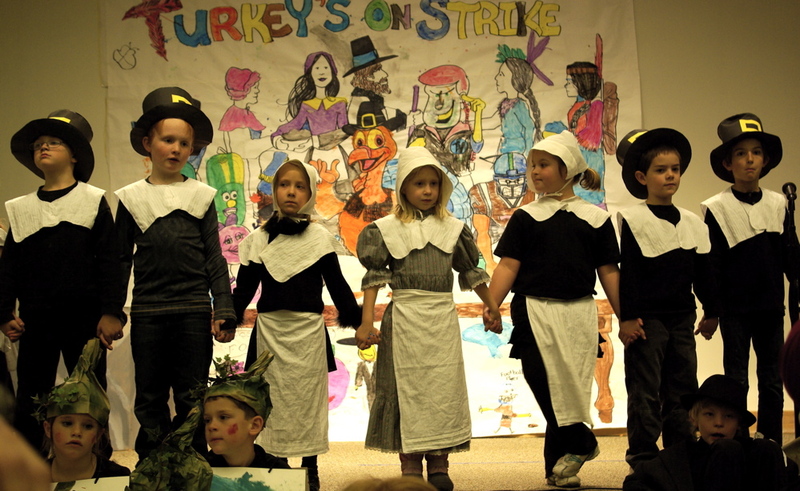 I didn’t make these pilgrim costumes but I do have a similar pilgrim bonnet tutorial, I like the simplicity of the design, and the hats. 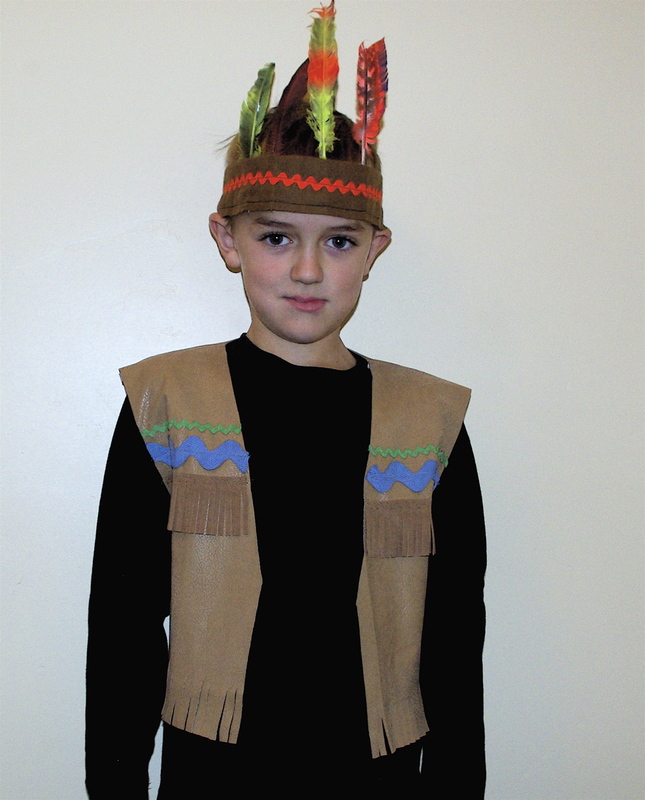 Check out my Native American Indian Headband tutorial to make the headbands shown above. I was lovin’ the moon boots on the little pilgrim in the middle, no frostbite on that one.